Opinion: Docklands To Become Melbourne’s Own Canary Wharf? Canary Wharf. It’s an interesting name, but it is also a worthy case study that those of us interested in Melbourne's Docklands can take lessons from. This new-build financial district east of London’s traditional banking hub, has had at least a 10-year head start on Docklands. Canary Wharf has a had this head start in terms of both development and time. But, most interestingly, the two are on a similar trajectory. In 1987 Canary Wharf was set up to breathe life into the desolate wharf area to the east of London’s CBD. The first tower was completed in 1990 and the first tenants moved in from 1991. Soon, almost all of the major banks had moved to Canary Wharf, but the urban renewal precinct was not embraced entirely by the community. In fact, many were vehemently opposed to it. Despite this fierce resistance, Canary Wharf is now widely considered to be a success. It is frequently used as a shining example of large scale urban regeneration and is on track to double in size by 2024. Just as London corporations were the first to embrace Canary Wharf, Docklands is now home to three of the big four banks (CBA, ANZ, NAB), two of the three big broadcasters (Channel 9 and Channel 7), a mixture of tier 1 and tier 2 accounting/advisory firms (KPMG and BDO) and many more (Fujitsu, Ericsson, Myer, Bendigo Bank - the list goes on). At the inception of Docklands, people would not have predicted the move of these big corporations away from the Central Business District into Docklands, yet here they are. In fact, Docklands has already outgrown its original development plan. In terms of overall buildout, Docklands is about 60% developed. The final piece of the puzzle is a thriving food, entertainment and nightlife scene. There are pockets of Docklands that have always been successful in this way, but there is room for it to become a more cohesive destination. This is where we can also look to what has happened at Canary Wharf for an idea of what to expect in the not too distant future. Canary Wharf is blessed with not having space restraints as with some clubs in Central London. The clubs in Canary Wharf tend to be bigger, louder and are open longer than most places in London. There are also great Canary Wharf bars and Canary Wharf pubs; perfect for a drink before heading on to an appropriately raucous jaunt through London nightlife. It is hardly sounding like the ‘desolate’ destination it was accused of being for years. The other exciting thing is that both London and Melbourne currently have frameworks in place to encourage 24-hour activation (such as extended public transport hours). As both cities move towards this way of operating, it will naturally flow on to their respective wharf areas. 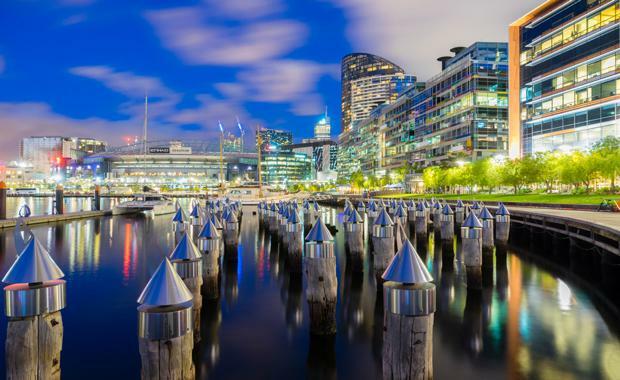 Docklands is especially suited to this mode of operation, with mixed use developments paving the way for it to be a thriving 24-hour metropolis for both tourists and locals to enjoy. I believe Canary Wharf shows us that we shouldn’t be so impatient with Docklands. It took time for London to embrace this new part of town, and it is proving to be the same here. We have all the right factors in play for Docklands to evolve and grow into the thriving precinct all of its supporters know it can be. Mohan Du is the Founder and Managing Director of Capital Alliance Investment Group, a Melbourne-based developer with mixed-use projects in Melbourne’s CBD and Docklands that aim to transform the cityscape and put apartment ownership within the reach of more people.